Edible Skinny loves a road trip like nobody’s fool so last month were delighted to hop in our ride towards the Bay area! There we explored Mysterious Mansions, dined on extravagant (and veggie friendly) tasting menus and at a hotel that has one of the most breathtaking views this country has to offer! 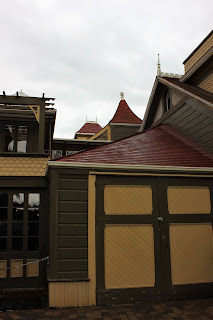 Our first stop was something for our inner Nancy Drew had been dying to do for years: a tour of the world famous Winchester Mystery House in San Jose, California! San Jose's #1 attraction, this “Mystery House” is the former home of Sarah Winchester, a widow of the Winchester Rifle fortune. The house is an extravagant maze of Victorian craftsmanship and eerie eccentricity. Informed by a Boston Medium she haunted by the spirits of those who had been killed by the guns that created her fortune she was also advised to moved westward and build a house until she died. And so, Winchester constructed her house with equal parts of money and crazy. Her additions to the original eight room structure started around 1884 and continued for nearly 38 years round the clock. The mansion now has 160 rooms spanning 24,000 square feet over six acres. There are 2,000 doors, 10,000 windows, 47 fireplaces, 40 stairways, 13 bathrooms, six kitchens, three elevators, and two basements. 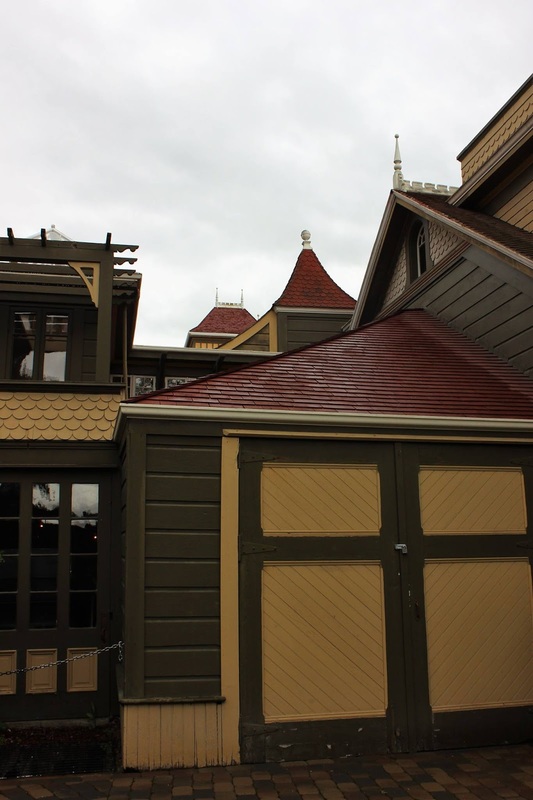 Legend has it that Walt Disney used the Winchester house as inspiration for Disneyland’s Haunted Mansion. With stairs that lead to nowhere, corridors that loop back on themselves, and doors that open into nothing, this is definitely a house to be explored at least once! 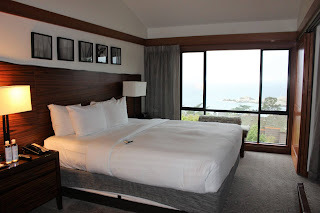 After our spooky tour we drove down the coastline to spend the night at the majestic Hyatt Carmel Highlands. This oceanfront retreat, which opened on July 28, 1917, recently celebrated a birthday turning 100 years old. Both the grounds and the view at the Hyatt are histrionic, focusing on what NorCal vistas do best: the drama of the ocean. Things may have changed over the hotels 100 years, the hotel has undergone major renovations in the past two years (with the opening of a new restaurant, a new lounge, new menus, and a new deck), but its mission remains the same: to offer an exemplary guest experience with impeccable service, world-class dining and breath-taking views in a hotel that seamlessly blends the amenities of a large hotel with the refined charm of a boutique hideaway. The Hyatt Carmel Highlands staff knows hospitality inside and out. Upon our arrival we were bestowed with complimentary glasses of champagne before being golf carted and umbrella-ed (it’s always on the edge of raining in Carmel) away to our expansive room with an even more expansive balcony view. 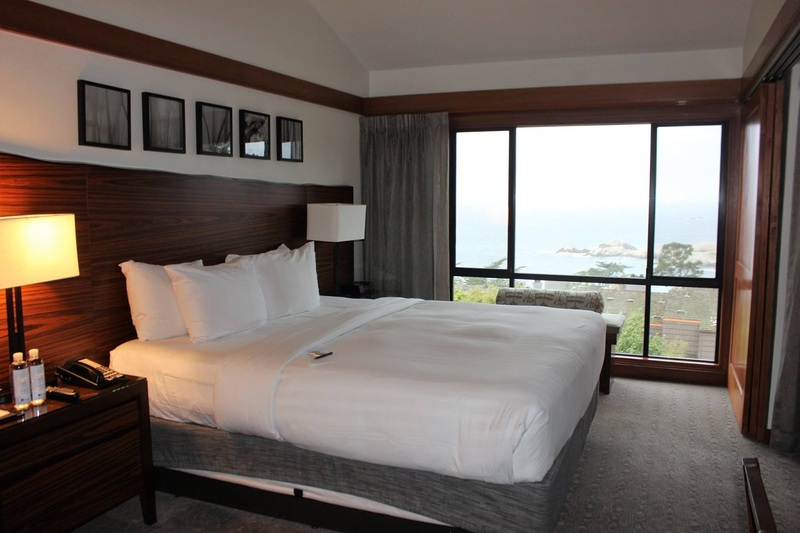 Overnight guests of the Hyatt Carmel Highlands enjoy one of the 48 non-smoking guestrooms that include 11 suites, 32 Ocean View rooms and five Garden View rooms. The rooms come with free Wi-Fi, 42-inch flat screen TVs and fully equipped kitchens. Upgraded suites add private balconies and tubs. Guests can also enjoy hotel amenities, like a heated outdoor pool, three outdoor garden spas, and a 24-hour fitness center. The Hyatt Carmel Highland offers live entertainment three nights a week and Happy Hour Monday through Friday. The room was dusted with the perfect details: fantastically fluffy towels, high tech coffee maker with local Carmel Coffee Roasting Company products, and a Hyatt Grand Bed, that was one of the most comfortable things I’ve slept on in months. And my favorite part: a natural wood-burning fireplace for that perfect end of the night fire. Kindling, newspapers, matches, and tons of different types of logs were provided, for that perfect snuggling opportunity on a cold rainy night (which is almost every night in Carmel). And even though the temptation of cozy fire was calling we headed out to partake in all that the Hyatt Carmel Highlands had to offer in award-winning dining at the newly merged the California Market at Pacific’s Edge. 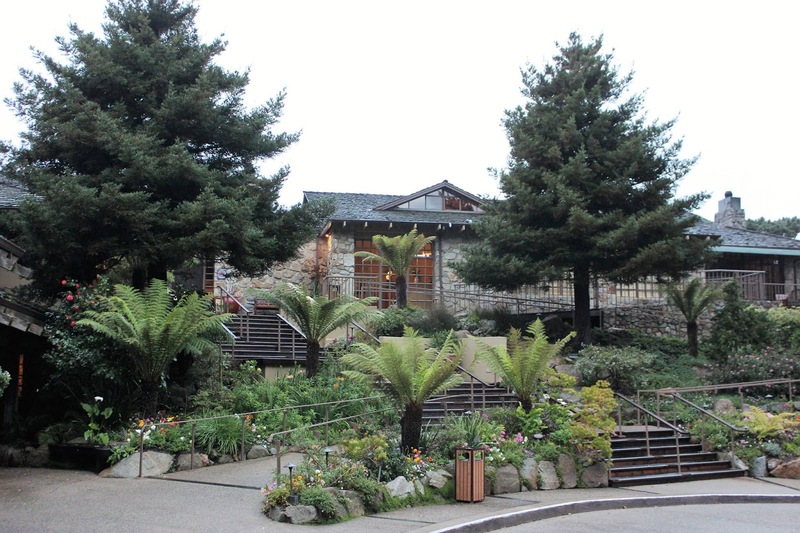 The fusion of the Hyatt Carmel Highlands' two popular and award-winning restaurants, the casual bistro California Market and the fine dining Pacific's Edge. This renovation created a new 1,200-square-foot deck, featuring louvered roof and glass-panel walls with dramatic views of the Pacific Ocean and the Big Sur coast. But the thing that made my eyes sparkle like the sea spray of the Pacific Ocean was Pacific Edge’s Plant-Based Tasting Menu! It was as if Gracias Madre had migrated to Big Sur… My first course appetizer was Almond Yogurt with root vegetables, pistachio granola, and cilantro oil. It looked like a desert, but was wonderfully savory in taste. The dish was expertly complimented by a glass of the M. Chapoutier Belleruche Rose from the Cotes de Rhone. My dining companion had the Brussel Sprouts featuring crispy Brussel sprouts, kimchi toasted hazelnuts, and dulse seaweed. Another perfect cozy plant based dish for a rain soaked night! And it should be noted how fabulous our waiter, David Bindel, was. This food specialist had been working at the restaurant for 12 years and he knew every element of the menu, pairing, and service in and out. He was present at our meal, but not overwhelming. And when Bindel needed to be scarce, he was practically invisible. My second appetizer was Squash Tom Yum (as dish I adored in my fish eating days, but never get these days because of the use of Fish Sauce in Thai dishes..). 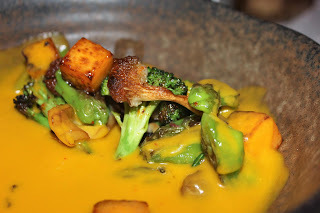 Composed of charred vegetables, local mushrooms, and coconut squash broth, it was the favorite dish of the evening for both myself and my meat eating dining companion. This was paired with a Dr. Loosen Riesling from Mosel, Germany. My dining companion’s second course with Pacific Edge’s famous Octopus featuring octopus braised in olive oil and then finished on the grill. Peppered with local heirloom baby potatoes, black garlic emulsion and sorrel it was an unsuspectingly tempting dish, so tender it could be cut with a spoon. And I should note the fantastic price point to boot on the Vegetarian Tasting Menu! 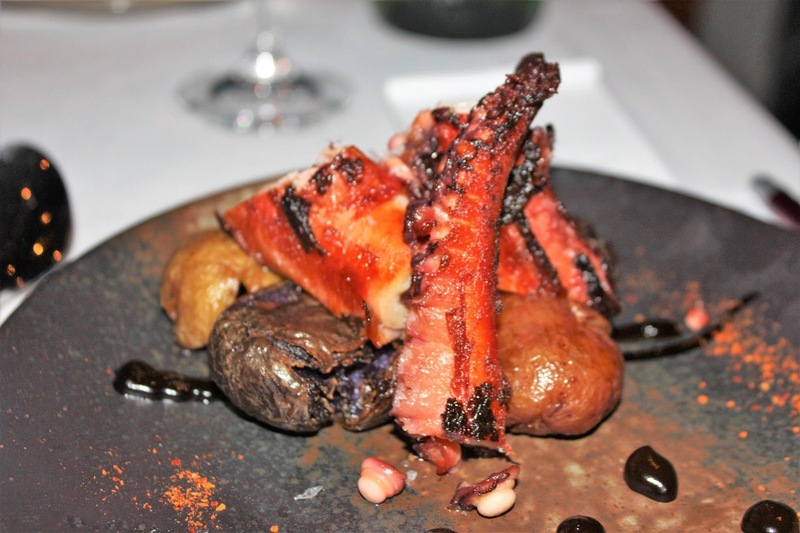 For a tasting menu at a restaurant with a breath taking view this meal is fabulously priced at $50 per person without wine pairing and $80 with 4 glasses of paired wine! Quite the delight to your pocketbook! My entrée was a Smoked Mushroom dish comprised of king trumpet mushrooms, heirloom cauliflower, Romesco sauce and pickled mustard seeds. This dish is the vegetarian version of the restaurant’s famous scallop dish. Chewy yet tender, the dish utilized liquid smoke for the perfect taste of the woodsy seaside hamlet of Carmel. My dining companion had a similarly crafted meal although instead of Veg friendly mushrooms, it was highlighted by scallops. The meal was paired with the fantabulous Stolpman Vineyard Syrah from Santa Barbara County. The wine was an absolute delight of earthiness! I finished off my four course meal with a Chocolate Hazelnut Tart with burnt marshmallows, wild huckleberry granite and whipped coconut cream paired with a Tawny from Portugal. The ultimate bite of sweetness to savory while listening to the raindrops above. After our dinner we huddled towards our room under a massive hotel umbrella, honing in on that finishing fire. When we arrived there was a bottle of Monterey red begging to be uncorked in front of the flames. And naturally we had to comply for the perfect button to the perfect road trip! Here’s to life being delicious and all roads leading to NoCal! Our Editor in Chief, Kat Thomas recently wrote an article that was featured in the Santa Monica Observer entitled 6 Ways to Plan the Perfect Wine Picnic with Bon Appétit's Wine Editor Marissa A. Ross! Check it out below! Here are 6 suggestions on how to plan the perfect wine picnic according to Ross. 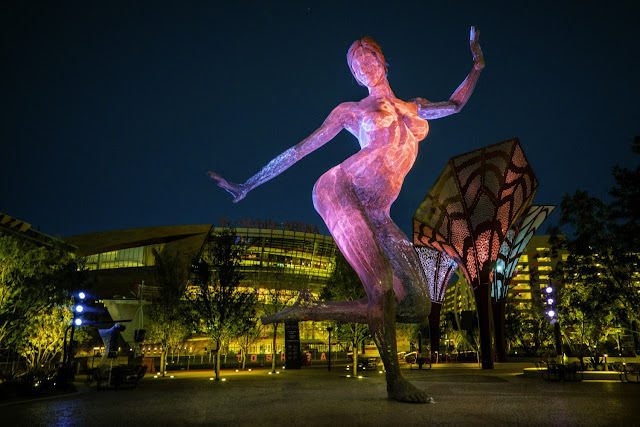 With Las Vegas being just a short plane ride away, the seminal Las Vegas food and wine festival Vegas Uncork'd by Bon Appétit, offers an incredible weekend of exciting culinary events for any jet setter (running April 27-30th). The festival, now in its 11th year, has added several new elements including having food stars Jean-Georges Vongerichten, Alain Ducasse, Michael Mina, Shawn McClain, and Charlie Palmer join forces to take over the only strip-side park for one unforgettable picnic experience. In preparation for this event, Edible Skinny sat down with Marissa A. Ross, Bon Appétit's Wine Editor and Vegas Uncork'd wine host, to talk about how to plan for the perfect picnic. 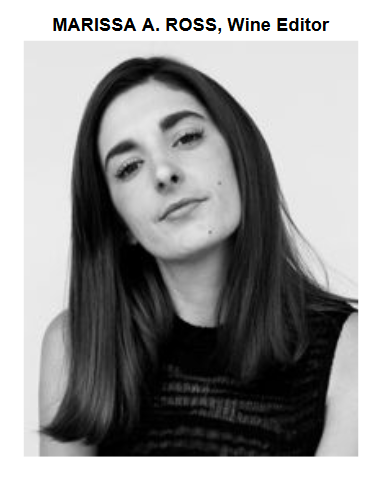 Marissa A. Ross is a self-taught wine drinker, writer and humorist based in Los Angeles. 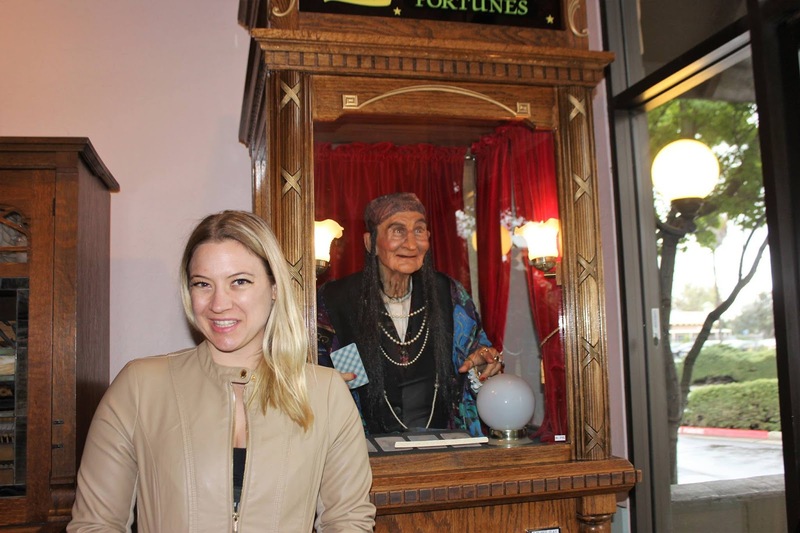 In 2015, she was named one of Wine Enthusiast's 40 Under 40 and her blog Wine. All The Time. was voted both Editor's Choice and Reader's Choice for "Best Wine Coverage" at the Saveur Blog Awards. Marissa is the author of Wine. All The Time: The Casual Guide to Confident Drinking (Released by Plume in June 2017). 1. LIGHTER IS BETTER – "It's important to start with a light body wine so it will complement the food perfectly. The nature of picnic food is that it's on the lighter side so keep that in mind with your wine too! Chances are you're not having a huge steak on the grass, so there's no reason to have a heavy Cabernet wine in the glass." 3. GO FOR LOWER ALCOHOL CONTENT – "With picnics lower alcohol content is better for everyone. A rule of thumb to remember is the higher the alcohol, the heavier the wine. So try to stick at 13% or below." 6. DRINK WHAT YOU LIKE - "My philosophy drink what you like. There are no rules in the end. If you want to biggest fattest Malbec in your life at your picnic, do it." Here's to life being delicious and all of your wines tasting like salty cantaloupe on the beach.